The Interval Controller (IC) is an advanced interval timer that can control multiple channels. After entering the IC screen the user should set the ‘Sequence duration’ (1). Under ‘Total frames’ the user can see how many captures are required to get the selected sequence duration with the current interval. Under ‘Available channels’ (2) there is a list of channels that can be used with this interval controller, in my case these are the channels for the connected NMX Controller on address 3 ( NMX Slider, NMX Pan, NMX Tilt, NMX Camera) and the connected Nikon D5000 (DSLR D5000). DSLR – this channel support the ‘Perform capture’ option (if enabled the capture command will be sent to this DSLR) and the ‘Capture finished notification’ (if enabled this DSLR capture finished notification will be used for motor movement). Channels also support operators that will change the channel value over defined time with an applied easing. Currently the ‘Interval’ and ‘NMX Motor’ channels support operator. Operators can be added by dragging the channel from the channels list (3) to the interval graph area (4). After the channel is dropped the operator dialog will be shown where the operator parameters can be changed(duration, easing, end value). Hi Zoltan i would be interested in helping you beta test this on android Platform when a build available.Thank you great work ! Can’t wait for this to work with the emotimo TB3!! 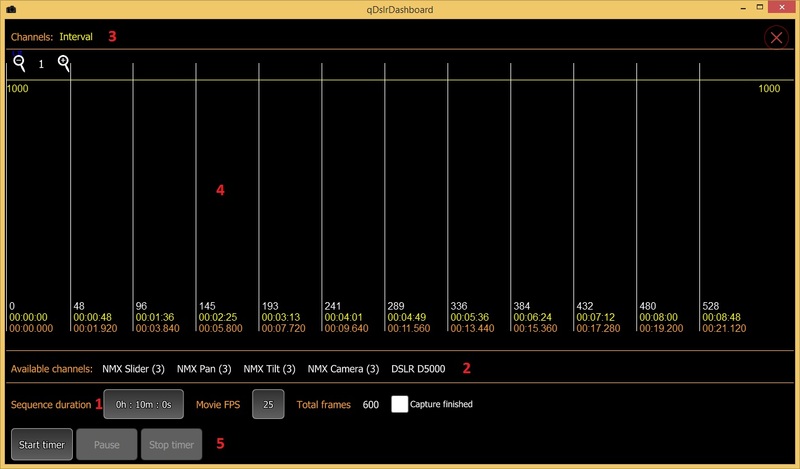 Love the idea of NMX and camera control in one app. Will NMX control be available via USB as well as Bluetooth or will I have to buy a new IPad with BLE? Better start saving for a new IPad with BLE. !